Postcard from Kefalonia – from Assos to Ithaca. Kefalonia, the gorgeous Greek island, is pretty hard to beat as a holiday destination. It has it all. Perfect weather, perfect sea, delicious food and spectacular mountainous forests and coastal scenery. This year took me back for my third visit and to the impossibly pretty port of Fiscardo. 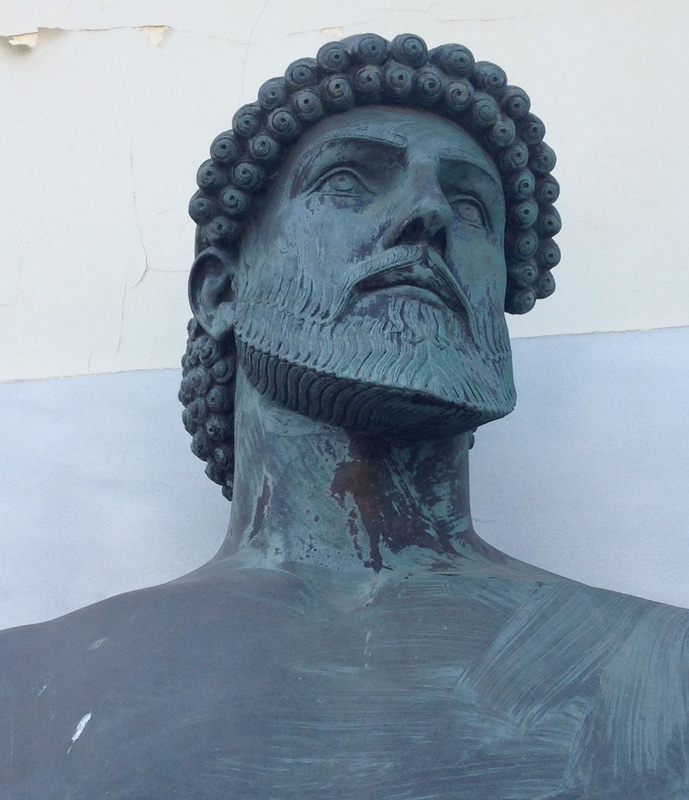 The most famous historical character connected to Kefalonia is probably Odysseus of Ithaca, king of the Kefalonians. I had read the story of Odysseus and his men (in translation of course) as a child and was always captivated by his adventures, even though the women never seemed to get to join in with the fun. They only got to do a lot of waiting about, weaving and some intermittent tempting as far as I could see. Anyway, we decided to follow in his footsteps with a boat ride from Fiscardo to Ithaca across the Ionian sea – supposedly his ancient home, although some say it was actually Kefalonia itself. We sailed off on a large, rather crowded vessel with the agent Nautilus travel, across the gorgeous turquoise, transparent ocean. I am not much of a sailor myself and usually become a bit queasy at the mere sight of a gangplank, but even I can see the attraction of wandering about on a boat on this beautiful (largely) calm body of water, through a mesmerising maze of little islands calling in at different ports for some fresh seafood and a bit of shore leave. Of course Odysseus had much more dramatic adventures than we did. He had to contend with hand to hand combat, shipwrecks and encounters with magical creatures, such as Sirens and Cyclops and Gods, but you can see the parallels. The Greeks are a nation of sailors. Our taxi driver told us how he learnt to navigate by the stars when he was just seven years old. ‘There are only three nations on earth that can still navigate by the stars’ he told us ‘The Norwegians, the Filipino’s and the Greeks.’ That I did not know. First we stopped at Gidaki beach, a real castaway destination, the largest isolated beach of Ithaca and only accessible by sea. If you want to get to the beach, you have to slide into the spectacular crystal clear sea and swim for shore which is actually pretty easy to do. The only tricky bit is where to put your money if you fancy buying a drink at the rustic beach shack, which was flying a Jolly Rodger flag for helpful identification. Vathi is Ithaca’s main town and tourist area and home to both a statue and a bust of our hero Odysseus, but Kioni village further round the island was my favourite – another delightful marina with small tavernas and a super pretty little church. Also a very nice bakery. Greek pastries and pies are not for those on the Slimming World plan but they are mouth wateringly good. We had giant croissants and a sausage roll, yum. Ithaca is a peaceful island with no airport of its own but it does have some lovely accommodation and caters for the more eclectic traveller. The cute little ports are also very popular with the yachting set. I can see why Odysseus may have made it his home. Another heartbreakingly pretty village on the mainland of Kefalonia is Assos, a picturesque secluded location with a horse shoe shaped harbour. The whole area is surrounded by beautiful coastal scenery of dramatic white rocks and cobalt sea with hillsides covered in forests of cypress and pine. Dominating the entire area are the remains of a Venetian fortress high up on the imposing peninsula. You really need a car to access Assos as it is at the bottom of a steep series of hair pin bends (very popular in Kefalonia) If you don’t have a car it wouldn’t pay to be in a hurry to get anywhere as there is but one bus, once a week, into the capital Argostoli. Can’t you see I’m concentrating! Little taverns perched on the quayside overlooking the bay attract most of the visitors and of course. the cats. There are always lots of multi coloured cats, and we spent a while watching a local cat looking for fish in the shallows. A visit to the castle requires a long walk amidst the olive tree forests until you reach an archway. 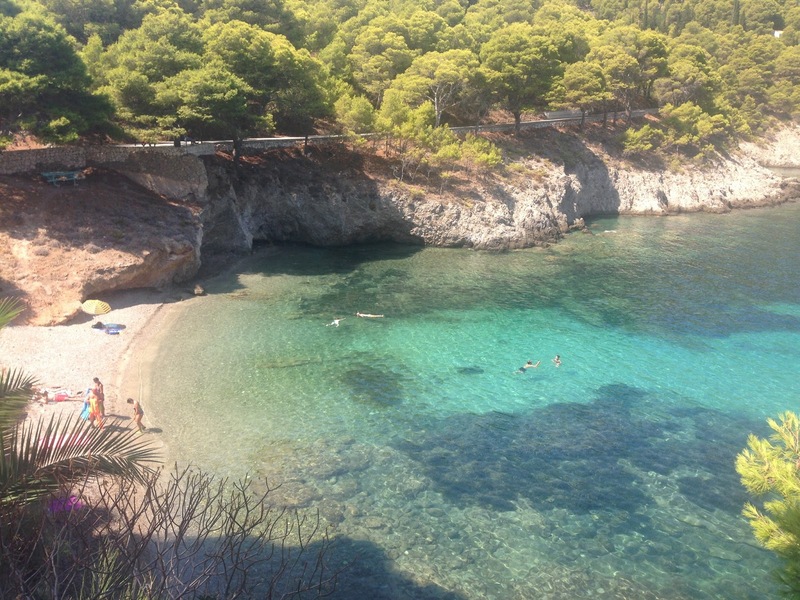 The little beach is another delight to swim from and you can potter about the coastal caves if you’re a good swimmer or just immerse yourself in that magical transparent Ionian sea. Kefalonia is a photographer’s dream. The colours, the light, the cats are all pretty stunning. To go back to our taxi driver once more, he explained that he had travelled the world as a young man before realising that the best place to be was actually right where he came from. ‘Kefalonia is like a special bubble,’ he said ‘ Here I am safe and happy.’ I think I can see why.